It is a crazy world to where we have to ask ourselves how to love yourself. But it needs to be done, which those who do truly love themselves are doing things that are readily available to us. Which when they do so, they are able to live more fulfilled and joyous lives. But you may be wondering what the best ways are to love yourself. Well below I get into 21 of the best ways to do exactly that, which you can start using today to love yourself with more than ever! When it comes down to loving yourself, you can start right where you are. Simply take time out of your day to tell yourself that you love yourself. Cultivate an attitude of gratitude about yourself and all that you love about yourself. At first it can be tough to find things to love about yourself, but keep looking. If you continue to look, you will find things about yourself that you truly love. Facial features like your eyes, nose or smile. Getting in the habit of loving the things about us will accentuate those aspects of ourselves even more in our daily lives. Allowing not only ourselves to appreciate them more, but other people around us. We shouldn’t seek love outside ourselves as that is one of the biggest sources of suffering of humanity. And in actuality, someone loving you may feel good for a while, but it isn’t a cure all. I mean the divorce rate is at an all time high, being over 50 percent of all marriages ending in divorce. If being loved by others was the true answer to happiness, the world would have no divorces at all. We need to see that the thing that brings us the most happiness in our relationships is GIVING love to others. As unconditional love comes from within. Every time you catch yourself yearning or looking for love “out there” remind yourself to look within. Then after you remind yourself, simply compliment yourself with a self-adoring thought. No matter how corny this may sound or look like. The more you invest in yourself, the more your self worth rises. The more you block out distractions of the world and focus on yourself, you will build higher levels of self esteem. Engaging in acts that show ourselves that we are worth investing in will naturally allow us to love and value ourselves more. How can you further your self-growth this week, this month and this year? The more you do so, the more you will build self-love. 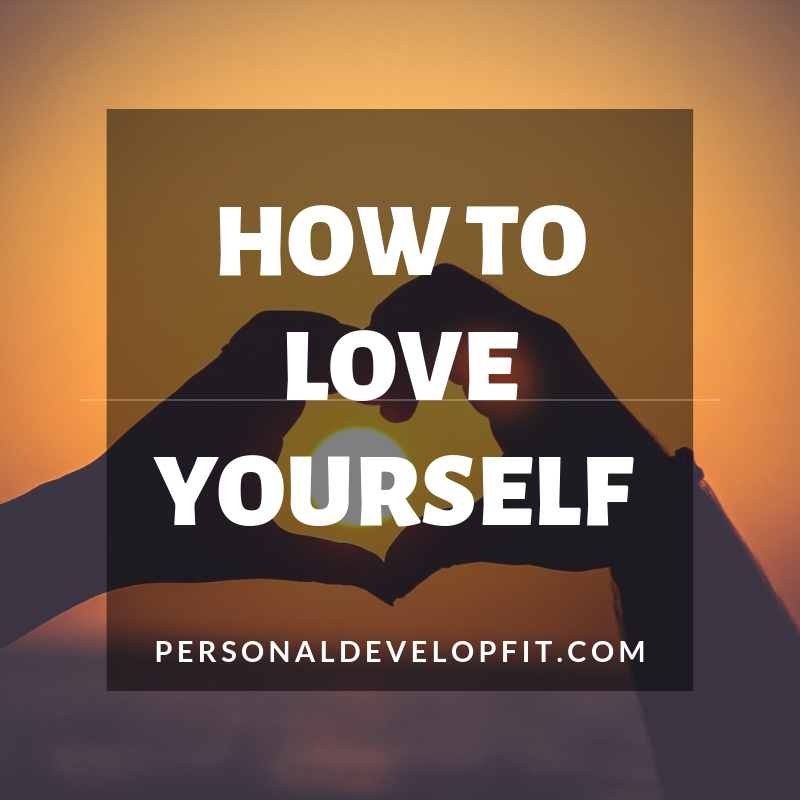 There is a great article that talks about how self-love is the basis of all personal growth. It also states an important fact that we aren’t closing ourselves off from others around us and indulging is self-adoration. It isn’t about being narcissistic. It is about compassion and openness. It talks about how our outer wold is simply a reflection of our inner world. By working on ourselves we not only feel more love for ourselves, but creates more experiences to receive love from others around us. Whether it is your offspring, your spouse, our dog or even your best friend. However you care about that person, you know how deep it runs. Feel and treat yourself like that person. That person is near and dear to your heart and you most likely treat them with the amount of love that you do because it makes you feel better too. It feels great to love our loved ones. But we have to live with ourselves for the rest of our lives. So why not treat ourselves the same way? We all truly deserve to treat ourselves in a compassionate and loving way. Treat yourself like you would if you already loved yourself as much as you want to. Then everything will fall into place. 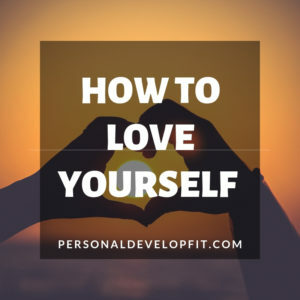 Want the best for yourself, just like you want the best for the loved one that came to mind when we started this tip about how to love ourselves. Another quick tip is to treat yourself as a mother does to her newborn. A mothers love is so pure in it’s essence. There is nothing flawed with a mothers love. It is the true essence of beauty. Treat yourself that way, from a mothers perspective. I had a lot of resistance to this at first as I had so much stigma around having a spiritual component in my life. But it is crucial to reaching true and sustainable levels of happiness. Nobody can do it alone. Integrating so sort of mediation, prayer, yoga, etc. Any activity that connects you to your higher self. This will allow you to feel a deep sense of love and peace. The Bible says it well, “Peace which surpasses all understanding”. My interpretation of this is that we can never understand true peace with our senses, or intellect. We must go past understanding and comprehension to truly attain this level of peace and love that we are all, I believe, truly seeking. Whether we are aware of it or not. Beginning: We see ourselves as needing and desiring. Usually more than we are getting from the world, or at least we are perceiving that we are receiving less. The amount we love others is dictated by how much they love us. It is a constant negotiation between us and our partner or people in our lives. Dependent and merging are words that describe this stage of spirituality. Middle: After we start to aspire to a bigger kind of love, our ego diminishes a bit and we begin to see our desires as mattering less than before. You see love more as a force that can bind everyone together. You begin to love others in a way where you don’t need reciprocation as much or at all. You love begins to mature along with becomes more peaceful in it’s experience. Our relationships begin to have less conflict and we are less defensive. Calm and unselfish are words that describe this stage of spirituality. End: After all of our limitations about love are left behind, we begin to love unconditionally. We feel it eminating from a spiritual source instead of from an egotistical source. It is allowing us to tap into what Oprah calls “the universal aspect of Being”. Love is now so much more fulfilling and self-sufficient leaving us in a state of fulfillment. Blissful and transcendent are words that embody this point of spirituality. When we have deep soul wounds, we can have feelings of guilt and shame. These are very self defeating and personality warping feelings. We need to extract these feelings by dealings with past hurts and disappointments that allow us to feel unworthy about. You can start to do this with mediation by witnessing your thoughts and letting them go. Your meditation mantra can even be “I love myself”. But if they are deeper than this and need healing above and beyond the tips I shared above, then we must seek professional help. Although it is uncomfortable to talk to a stranger about our problems, it can help you turn your emotional life around. It is also showing yourself two things. That you love yourself enough to deal with problems that most are too scared to get help with. And the fact that you are courageous enough to face your demons and move forward. Also, when it comes to these wounds, we should start seeing them as simply growth experiences are the muscles we built in order to overcome adversity in the future, not just simply wounds that need to be healed. If we let them define us in a way where we grow from them instead of letting them run our “story”, then we can use a bad for good. A true superhero power. We shouldn’t stay stuck in our story unless it is supporting us. We need to deal with these hurts then move forward. Otherwise we can live our entire lives retelling the same story to ourselves and others, over and over again. In order to truly love ourselves, we must disassociate ourselves from these stories. Yes they happened to us, but they don’t need to define us. Let you triumphing over it and profiting from it, both emotionally and physically, be what defines you! A quick tip on how to let go of emotional baggage is that you can see things from someone else’s perspective. Lets say that you were beaten up when you were little by your sibling or picked on by a bully. Chances are that in some way, shape or form that this individuals was a victim at the time of the same condition they were afflicting on you. I know this doesn’t make it right or that it was easy going through this time. I am just saying that it can allow us to bring more compassion to the even or time period in our life that we are trying to move past. Again I am not saying you need to forgive this person for them. Because they may truly not deserved to be forgiven. I am saying that you need to forgive them for YOU. This shift in perspective can be huge as we really can stop ourselves from forgiveness because we feel as if we are letting people off the hook for these negative actions they took against us. But look at it as if you are breaking free of what you have been carrying around and allowing yourself to move forward into a happier existence. We need to realize that we aren’t perfect. That life isn’t easy and that we are warriors, all of us for even getting up each day and moving forward. When you see things from your past that you are embarassed about or make you feel as if you don’t measure up, learn to laugh them off. It isn’t serving us right? No one is perfect, we make mistakes, we are only human. Love yourself by forgiving yourself for not doing everything perfect. Your “mistakes” have made you into who you are today. Be proud that you were bold enough to live life in a way that allowed you the opportunity to make mistakes. It means you were courageous enough to go out and scrape your knees and get a little banged up. Many people play it too safe and don’t make these mistakes because they AREN’T LIVING. Realize that everyday is a new day to move forward and make great choices that will allow you to build a great life. The past is just that, let is pass on and move forward into a future of possibilities. One of the best ways to love ourselves and help love ourselves more is to be around people who value who we are. People that want us to win, want us to be happy and will hold our hands through all of our successes and failures. People that will pick us up when we fall as well as be just as happy if not happier when we win. We need to isolate ourselves from people who aren’t truly there for us. Get them out of our lives as fast as humanly possible. A great article talks about how we can go about making good friends that offers tips for us that we can utilize to do so. It starts off with knowing what we should look for in a friend which includes how a good friend will show a genuine interested about what is happening in your life along with truly listening about how you feel about the things you are talking to them. The will accept you as you are and not want to change you. They will also be comfortable about sharing things about themselves with you. Can I truly trust this person? Am I truly myself when I am around this person? Does this person treat me with respect and are supportive? Do I feel secure when hanging out with these person? Some of the places that we can go about creating healthier relationships include volunteering events, taking a new class or joining a club that is filled with people who have similar interests, dog parks, art galleries or going to games to support your local teams. When it comes down to it, we also need to be doing our part to building a love relationship. This can include doing things such as intensely focusing on the other person and putting yourself in their shoes. Truly taking the time to get to know the person past just what is on the surface. We can do this by ignoring our phone and outside distractions. Maintaining great eye contact and matching their body posture in order for them to feel more comfortable opening up to us. Truly treating people in a way that you would like to be treated in the perfect loving and harmonious relationship, is a great way to start developing better relationships in our lives. In order for us to start to heal, we need to get the toxic and dark people out of our lives so that when we lay our heads down at night and sleep, we will rest soundly and wake up with a more positive mind. This will allow us to change our outer world. Now that we are starting to quiet the inner world. We need to realize that when we have these people in our lives. Whether they are brand new friends, or have been there since day one. That we consciously or subconsciously dread seeing them and going through the daily existence of being around these people. People who don’t want to you to win or people that simply or OK with the status quo. People that are OK with not supporting you. Once we start to pluck these individuals out of our lives, we begin to lift the fog off of our minds and start to see ourselves in a new light. A light that isn’t tainted by other peoples perspectives who don’t want the best for us. When we start to build better relationships with people who are striving and bettering themselves, we will get a bigger picture of ourselves. This will allow us to love ourselves more. Put out more loving vibrations to the world around us. And strive for bigger and better things. There is a quote that says “People are put in your life for a reason, others for a season.” Recognize when the season is up for people and don’t let them enter into the next season unless the are meant to be there. And better yet DESERVE to be there. The power of visualization is incredible. The best way to start a more loving relationship with yourself is to envision seeing how it would feel, look and sound if you actually loved yourself with all of your being. See it in your minds eye. It can make us feel absolutely incredible to do this activity. Keep doing so each day. Soon what you see in your minds eye will become a reality. The power of visualization can be tough to tap into at first, but like a muscle, the more you use it, the stronger it will get. Do this my friends, I believe in you and your power to transform your relationship with yourself through visualization. Often times we listen to our minds way to often, which can help us, but not in a way that we can if we listened to our heart and intuition. Steve Jobs truly said it best. Intuition already somehow knows what we truly want and desire, which when acted upon, will allow us to attain happiness in a big way. This will also open the flood gates for self-love as we will truly be living our souls desires. Where are areas of your life where you should be listening to your heart and intuition instead of your head? It takes courage to listen to your heart over your head, but if you can tap into the courage, look around your life each day and ask yourself if you are acting with your head instead of your heart. Once you see that you are doing this, you can make conscious decisions to starting changing this. Accepting yourself for who you are. This can be as easy as simple making the decision in the here and now to truly accept yourself. Don’t listen to the negative voice trying to stop you from making this decision. Powerful think and feel the decision of deciding that you accept yourself wholly and completely. Also check in with your intuition often. It will allow it to come to your forefront a lot more often. Cut yourself slack when you are sliding backwards and get in touch with your intuition with things like yoga, mediation, or even getting a massage. Also don’t be to rough on yourself when you catch yourself not checking in with your intuition as much as you should. Simply catch yourself backsliding and then work on allowing your intuition to be more at your forefront. The important thing to consider are the things that got us to where we are right here and now. The truth of the matter is that if we are discontent with anything in our lives, it is our fault. We made small decisions everyday to not do or not do something in which it created a downhill spiral towards where we don’t want to be. These small decisions are so deceiving as they don’t seem to be having an impact on us in the moment. But these decisions add up. By evaluating what you have done to put your current situation where you feel that you need to love yourself more, you will identify things that you need to stop doing TODAY. A lot of these things can be bad habits, which the only way to replace a bad habit is to do so with a good habit. Which can be done with time and repetition. Decide today that you will swap bad habits for good ones. Know that you are worth it and that life is too short to put off the change that is going to create and build for you a happy life. Another way to really show yourself so self love is through accepting yourself. The power of self-acceptance is up there with gratitude as far as the how powerful it is. A great way to start accepting yourself is by identifying all the things, situations and character traits that you may not particularly love right now about yourself. Either make a list of these things, or simply take one on at a time and accepting yourself or whatever it is that you don’t like about yourself. If it was a wrong choice you made in the past, accept yourself for being human and try and forgive yourself. If it is something you don’t like about your physical appearance, embrace it fully by accepting it over and over until you feel better about it and the energy around it isn’t as intense. Accept everything in your life. Acceptance can be seen as passive but it is anything but that. When you accept things as they are, you can start to see them as they really are. Often times the things we don’t accept about ourselves are just programs ingrained in our mind by what the world tells us we should look like or behave like. Once you accept these things, you either decide to live with them in a positive loving life, or go about changing them. But from a self love perspective, and for the betterment of yourself. Instead of doing so for purposes outside of doing so for your true happiness. We have all been through terrible things, so unfortunately more than others. But we all have had a good amount of suffering that we have gone through in this life. The thing is, if you are reading this, you made it though.You are a solider. See yourself as the warrior that you are. Recognize that you have fought your way though tough times and that they have given you an armor to be stronger for it. By looking back at all the things we have fought though and battled through and made it to the other side from. We can start appreciating ourselves and our efforts. Increasing our feeling of self worth and self-love. Allowing us to love ourselves for it. Life isn’t easy, but the fact that you have made it this far can allow you to see yourself as a victor and love yourself for the life warrior that you are. By seeing that we have fought your way though things, it can give you us a innate sense of having power of our existence. That we are in control, and being in control feels damn good! Embrace this about yourself, and use this as a feeling you carry with you everyday. It will help you build a better future as you will see that you are the captain of your own ship. We beat ourselves up a lot. I know with myself that I set extremely high standards for myself and am always worried about fulfilling these standards and high goals that I have set for myself. But when it comes down to it, if we can become a little bit more detached from the outcomes of situations and scenarios, we can learn to feel better about ourselves during the process. I am by no way, shape or form saying that we should let up on our effort. No way. I am saying that we should tackling things with the ferocity and tenacity that is necessary to crush our goals and dreams. But do so in a way where we aren’t attaching our happiness and entire indentity to the outcome. When I have really done this, I feel as if I still get the goal and I have more mental and physically energy during the process of working myself towards the attainment of the goal or vision I have. The next step and truly, in my opinion, one of the most important steps of all, is to take a preventative approach to your health and wellness. We need to treat our bodies with respect and discipline. This is where so many people miss the boat. We can do everything else right, but if we aren’t feeding our temple with the right things, then we are going run this epic vehicle or a body that we have into the ground. We need to treat our bodies with respect. This is a high form of self love. You can’t truly ever love yourself you aren’t in good physical shape. This is the only body you get, and if you aren’t optimizing it by eating good, nourishing foods and working out along with integrating a whole active lifestyle with, then your life will never be as good as it could be. We live in our bodies everyday so we need to make everyday count by creating healthier bodies. Not too look good, but to be able to take life on with strength and vitality. It is like having the option to have a old dusty camaro sitting in the garage with the original engine, torn up interior and a bad paint job. Or to soup that baby up, put a 454 engine in it, put a fresh coat on it and put the finest leather interior in it known to man. To truly respect yourself, you need to create a diet plan that you follow with daily disciplined habits. I am a personal trainer and when my clients start to do this after years of not doing so or even never doing so, their levels of self love and self respect go through the roof. Trust me. Once we start taking care of our bodies, we are taking a preventative approach to our health and well being. We will be able to avoid diseases and disorders that come from leading an unhealthy life. We will treat our bodies kindly, by giving it healthy, foods instead of garbage filler fast foods. It is showing yourself that you care about you are your longevity on this earth. Creating a health plan will allow you to take the edge off of your life, it will allow you to manage your day better. It will release chemicals in your brain that allow you to manage chaos better. And not be as affected by things that usually affect you. This will allow you to react more accordingly to life, and make better decisions. Other things you can do to take a preventative approach to your health is to get health screenings every year. IT is overlooked by needs to be done to keep on top of your health. When we criticize ourselves or anyone else, it is a reflection of our beliefs about ourselves. Things like the feelings of not measuring up, not being enough, a deep sense of lack and space to be filled. We need to stop it all today. Stop criticizing yourself once and for all. When you catch yourself doing so, just stop doing it right in your tracks. If you want, replace it with saying something that is supporting about yourself. If not, then simply stop doing it. The energy of criticism vibrates very low, consuming our energy and the peoples energy around them. It comes from a sense of pride and denial often times or simply low self esteem. By engaging in it, we are keeping ourselves from reaching higher potential as dark energy can not let in light energy. Always start with yourself in anything in this life. As with anything else, when we stop criticizing ourselves, we naturally stop criticizing others and start to learn to see the good in people. As you will begin to replace the bad habit with the good. This is the only way to break a bad habit. Once we stop with the negative habit of criticizing ourselves, we will natually start to become more positive people. We will vibrate at a higher energy or level of conscious allowing ourselves to just be naturally more loving toward ourselves and other people. At first it will take effort, then the law of familiarity will kick in and it will become natural for you to do so. We cannot live in a state of fear and love at the same time. For ourselves or anyone else. If we are constant in fear of what could happen with our lives or what is becoming of it, we can’t ever experience pure states of love for ourselves. I remember a video of a lady whom was a law of attraction coach. She said to list out all of your fears and right next to them make a list of positive affirmations. By writing down your fears, you will see them for what they are, not what your ego is trying to make them out to be. More often then not, our minds create worst case scenarios out of all of our fears, or gives us feedback in the form of feelings in which aren’t accurate to the actual danger of the event. If we can list out our fears and rationally see them as not as big as we have been thinking they are, we can move forward with more courage. The more courage we have, the more we can face our fears. Fear never truly disappears, but we just become stronger through courage to face our fears. Which in turn as we face more fears, we become more courageous. I don’t believe that FEAR stands for false evidence appearing real. It is real to us, very real. But when we acknowledge it by jotting it down, we can make it less powerful. Go through your list every day and soon you will start to live out these new affirmations and literally change your entire life that was once fear based, can now become courage based. Les Brown talks about how there are things in our life in which we truly regret. We were a bad parent, cheated on tests, cheated in a relationship, kicked our pet. Whatever it is, there are things in life in which we either wish we could go back and change or simply we don’t want to look at it because we are so ashamed of doing so. The past is the past, but we can feel better about it through the power of forgiveness. We often torture ourselves about it for years. Maybe, as with myself, I think I deserve this punishment because of the reason that I hated by actions. But how long do we need to do this to ourselves? I that the faster we can forgive ourselves, the faster we can feel more loving about our existence. The more we have that we are suppressing, things that we wish we could change, the more we live in a toxic mental environment. The more we forgive, the more we feel lighter and more childlike and joyous. It lets our true happy and unconditional loving nature shine through. Something that has been there this whole time, but we covered up with things. Now this also includes forgiving other people as well. Whatever tehy have done to you, how they did you wrong. It is not beneficial for us to continue to hold onto these things. Often times we think that if we continue to hold onto this resentment or hate that we are winning. That if we let it go, we will lose or they will win and we will now be OK with the actions that they took. That we will be the weak ones if we allowed this to happen without changing our mindset around it. Les Brown also talks about how whatever is in your environment is a reflection of your consciousness. If you don’t love yourself and want to do so more, then you need to start evaluating what is going on inside you. Forgiveness can be a great way to clean out the inside so that the outside will clean itself up. He goes onto say how to start forgiving these people. He starts out with working on seeing things from their point of view. Often knowing that this person probably isn’t even aware of the ill feelings that you harbor or doesn’t care. Lastly know that every thought we have is carrying with it a positive or negative charge. When we have negative feels towards people, they affect our immune system in ways that make us vulnerable to mental and physical diseases and disorders. So when we let them go, we ill literally transform our immune systems to not allow our bodies to heal naturally. But also create a environment in which illness cannot thrive. Be gentle with yourself. Learn and grow. A great blogger and personal development coach Aaron Doughty talks about how the best way to forgive ourselves is to see that our decisions at the time, good and bad are the ones we needed to make to come to the point in life of where we are at NOW. That the fact that you are feeling perturbed and feeling like you don’t love yourself because of these things, is actually a positive. Hang here with me. Because if you didn’t have these emotions of lack of love for yourself because of these events, you wouldn’t be compelled to do anything about them. You wouldn’t be on this page right now. You may be stuck in complacency, or believe that you don’t need to grow. The worst things ain life can lead us to the biggest breakthroughs or lead us to the ultimate truths we’ve have been seeking. And do so at a much faster and exponential rate than we could if we weren’t provoked to do so through our dark times. Whatever you want tout of this life, no matter how long it has been since you have given up on it or if you still have hope. Regardless of what it is, go after it NOW. Loving yourself means rewarding your hearts true desires. Giving your soul hope by igniting the flame of passion and going after yoars goals and dreams. Whatever they may be or how crazy people are going to call you. Go after them as if your life depended on it. Because it truly does depend on it. Your level of happiness is predicated on you going after your souls desires. The more you do so, the happier you become because you are seeking your true purpose. It puts us on the right path. And when we feel ourselves going in the right direction, we are happier and more loving to ourselves. Another act of self love is to be completely real with people around you about what you need from them. Let them know how they can help you feel better about yourself and life. No one can read minds, we can’t assume this. Communication is a large part of living a better life. If we can communicate our needs to our loved ones, they will know how to treat us. We need to value ourselves enough to communicate honestly with people around us. Communicate your needs, don’t be quiet. Take care of yourself by communicating your needs right off that bat in relationships. The world tells us that we need to look a certain way, be a the best relationship. Wear certain clothes. Talk a certain way. In order to be happy and live a fulfilled life. All of these preconceived ideas are all stuck in our minds and we are operating off them. Searching for our happiness in these things. But the truth of the matter is that in order to be truly happy and love ourselves, we need to start letting go of all these beliefs. Let go of what the magazines tell you that your supposed to look like. Let go of the advertisements telling you to buy beauty products to help you become more beautiful. Let go of all the propaganda leading us to believe that we need to be a certain way or look a certain way to love ourselves and be loved by others. Our true nature is pure love. It is what we are all seeking and ironically that which we are seeking is closest too us. We literally don’t have to go anywhere to find it. So in order to experience this true state of love that we already are, we simply need to let go of things that aren’t us. When we let go of things that aren’t us, the real us is able to shine through. Allowing us to feel more of who we truly are more and more as we shed these misconceptions. Now I am not saying you should throw away your goals about looking better and feeling better. Always strive to better your self and grow. But do it for you not because someone or some advertisement told you to do so. Tony Robbins talks about how at a certain time in our lives we choose to believe something that isn’t conducive to us living a happy and healthy life. For example, he talked about how someone identifies with the belief that they are big boned and they will never lose weight because of this. Or that they have always been a smoker and that is just who they are. They identify with these beliefs. And when he is talking to people that speak this way, he will ask them when they decided that they were this particular thing. You see when we identify with our beliefs, then we act upon them with absolute certainty. Because we want to be appear consistent to the world and to ourselves. But when we start questioning when we decided things that are sabotaging our growth as well as ability to love ourselves, we can see that we in fact are responsible for instilling these beliefs in our mind and that we can extract them or replace them with beliefs that are. For example, if we say that we aren’t worth or love, we can ask ourselves when we made this decision and started to believe. We can also examine things that were going on in our lives at the time that led us to make this decision. It could have been loved ones telling us this. We can psychoanaylize ourselves and be able to identify why we created these negative programs and let go of the situations that led up to these choices. Again going back to forgiving ourselves and others. The easiest way to forgive others is see things from their perspective. See that they are operating off of a core belief that they believe about themselves and they are just projecting it on you. Or they don’t feel worth about themselves so in order to feel good about their life, they need to bring you down. It doesn’t have to be taken as fact. I came across a great exercise offered by Jack Canfeild in his book “The Success Principles”. The exercise is to look at ourselves in the mirror and tell ourselves all the good things we did that day. Then at the end of it, say “I Love You” to ourselves. Often times we think we didn’t accomplish anything meaningful during the day. Or at least we feel that way. But when we recognize the little wins we had along the way, we feel good about ourselves. Is this a bit self indulgent. Absolutely. And you deserve it. It is for the betterment of you and your growth. Try doing this right before you go to bed each night for 30 days. At first it will be weird and you may want to bail. Which is natural. But push through and feel how powerful this exercise is and how it can transform your life. Letting you see yourself as a winner and also love yourself through the process. So there you are my friends 21 of the best tools in the world to love yourself more through. I really hope you got value out of this post and would love to hear what you think about it. As well as which technique or tip was your favorite of them all. Also if you have anything to add, I would love to hear about it! Hope you guys are having a great day!